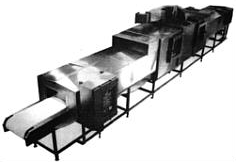 Microwave Continuous Cooking System Typical throughputs for the MMB-3, based on an ending yield of 40%, would be approximately 5 pounds per kilowatt, depending upon slicing temperature and grade of product entering the oven. A system comprised of two MMB-3 oven cavities and three Microdry Model IV-75, 75kW microwave transmitters would produce eleven hundred pounds of fully cooked product per hour. The Microdry industrial tempering tunnel is constructed of stainless steel and polypropylene for ease in cleaning. Tunnel openings are large enough to accomodate standard meat packages, and the tunnel is equipped with attenuator doors at each end to allow the user to process small packages of meats or varied products. The standard model TC-75 comes with a Model IV-75 Microwave Power Generator. The Model TC-75 is designed to accomodate two IV-75 Generators giving a total power input to the cavity of 150 KW. MICRODRY’S new microwave / air drier is more versatile with its 400ft./minute air flow. Our new standard oven combines the unequaled 80% energy efficiency of a microwave drier with state-of-the-art air drying. Each multiplies the efficiency of the other.